Airbus has upgraded its assessment of the likely number of passenger aircraft serving Australia, New Zealand and the nations of the South Pacific over the next two decades as the lift in tourism and the rise of the middle class enables more people to take to the skies. The total number of aircraft flying within, into and out of the region is expected to expand from 749 aircraft currently to 1,358 by 2036, an increase of 609 aircraft over the next two decades. 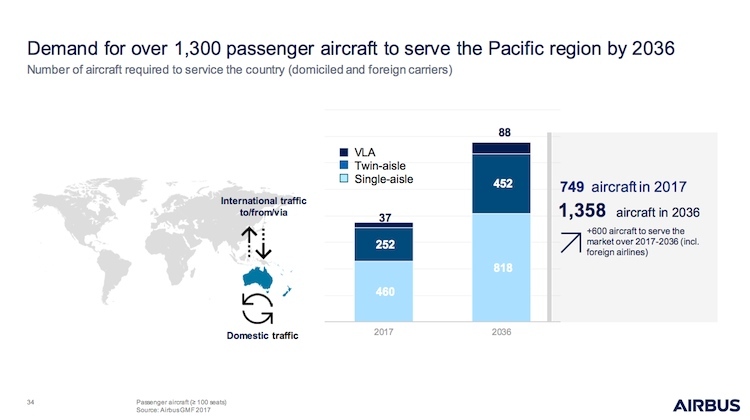 The figure is not the number of aircraft in the fleets of Australian and South Pacific carriers, merely the number of passenger aircraft from all airlines that serve the South Pacific domestic and international markets. It is a more upbeat assessment compared with Airbus’s most recent outlook for the region that was published in 2015. At that time, Airbus said the number of fleet serving the region was expected to grow by 499 aircraft over the 20 years to 2033. Airbus vice president for the Pacific Iain Grant noted the population in the region was expected to reach 50 million by 2036, compared with about 40 million in 2016. Further, the number of people in the Pacific defined as having a middle-class or upper-class income – those with a yearly income of $20,000 or more at 2016 prices – would grow from 37 million in 2016 to 47 million by 2036. “This obviously feeds air travel,” Airbus vice president for the Pacific Iain Grant told reporters during a media briefing in Sydney on Thursday. Further, the significant growth in inbound and outbound tourism in both Australia and New Zealand – the two largest nations of the South Pacific – was expected also spur demand for aviation. Demand in the region, measured by revenue passenger kilometres (RPK), was expected to double from about 400 million to about 900 million over the next two decades. 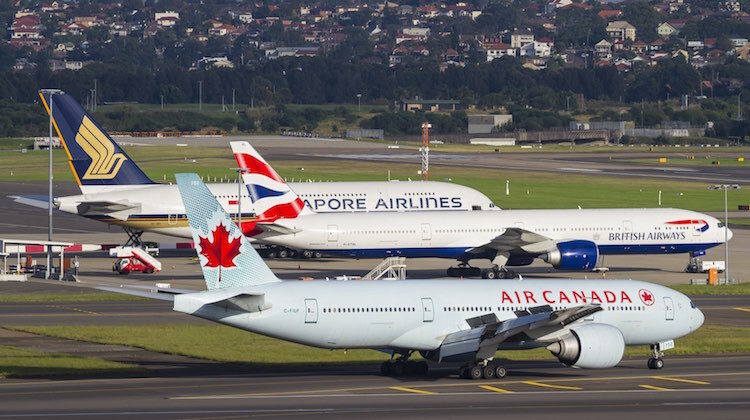 In terms of Australia, the Airbus forecast said the number of passengers in the country’s top five cities was expected to double to 180 million by 2036. “There’s lots of flights, there’s lots of seats and there’s lots of ASKs [available seat kilometres],” Grant said. The number of single aisle aircraft flowing to and from or within the region was expected to increase from 460 airframes to 818 between now and 2036. Meanwhile, twin-aisle aircraft (which typically seat between 250-400 passengers) was forecast to grow from 252 now to 452 aircraft over the next two decades. And the company remained bullish on the very large aircraft segment, with the fleet of aircraft capable of carrying more than 450 passengers expected to more than double from 37 currently to 88 by 2036. This is despite a dearth of orders for the Airbus’s A380 – the world’s largest passenger aircraft – in recent times. Airbus director for strategic marketing and analysis Andrew Gordon said there was still much reason to be optimistic about the very large aircraft segment, as airports become busier and slots more scarce. “If you look at a classically constrained airport which is London Heathrow, 10 per cent of all the people who fly at Heathrow fly in an A380,” Gordon told reporters. There was also the prospect of new business models for the A380, such as a leasing company offering the aircraft to airlines on a short-term basis when they needed a lift in capacity during peak travel periods. “There is a great opportunity for new business models to be able to utilise those aircraft,” Grant said. The 2017-2036 Airbus global market forecast was first presented at the Paris Airshow in July. It predicted there would be 34,890 new aircraft deliveries over the next 20 years, an increase of 1,829 aircraft compared with the 2016-2035 report. Airbus said Australia and New Zealand were expected to have five so-called aviation mega-cities by 2036 – Brisbane, Melbourne, Perth and Sydney, as the growth in global passenger traffic results in new routes from local and overseas carriers. The Toulouse-based manufacturer defines an aviation mega-city as those which have more than 10,000 long-haul passengers a day. Currently, Auckland, Melbourne and Sydney are the only cities in this part of the world that meet this criteria.